She wants a beach holiday so she can lie on the sand, relax and tune out. He gets bored doing nothing and needs constant activity. Or it could be the other way around (don’t want to be making assumptions!) – he might crave beach side oblivion and it might be her seeking white knuckle adventure. Whichever way it is – they need to find somewhere which will tick all the boxes for holiday perfection. I have an answer. Visit the glorious Turks and Caicos islands. This fabulous island chain, 550 miles south east of Miami and only a ninety minute flight from the US mainland, is one of the best kept secrets in holidaying history. Turks and Caicos are a British Overseas Territory, governed by British law and with the Queen as monarch. Who knew? But the feel of the place is far more chilled out Caribbean than British stiff upper lip. If you are looking for a place that covers all the holiday must-haves, read on for details. International flights into Providenciales (Provo to the locals) are frequent, convenient and plentiful. Some people fall in love with Turks and Caicos when they stop by on a cruise ship – vowing to return later to this island paradise oozing laid-back charm. Most of the wonderfully well equipped resorts and hotels can be found along the world famous Grace Bay on the north east shoreline and are easily accessible from the airport. The sensible and careful civic planning on the island has ensured over development of the area is not a problem. Resorts and hotels are mostly on the small side, giving them a more welcoming and hospitable atmosphere. The inhabitants (there’s a regular permanent population of thirty thousand) take hospitality very seriously, so prepare to be made super-welcome on your arrival. It’s very common for many people to equate holidays with activity, discovery and adventure. Lying on a beach doesn’t suit everybody. This is why Turks and Caicos is the perfect fit for action seekers, too. Being surrounded by warm, crystal clear waters means that T&C is a water sports Mecca. There is so much to choose from – kayaking in the salt marshes, windsurfing, paddle-board, scuba diving and deep sea sport fishing are all contenders on the islands. The deep ocean is home to a vast range of marine life and www.gsfishing.com are the key charter company for trips that allow you to cast for Yellowfin Tuna, Wahoo, Shark, Mahe Mahe, Marlin and other fishy giants. Sitting in a fighting chair on the deck of a beautiful fishing boat, wrestling with a heavy weight Tuna or Wahoo on the line, is enough to get to anyone’s adrenaline pumping. 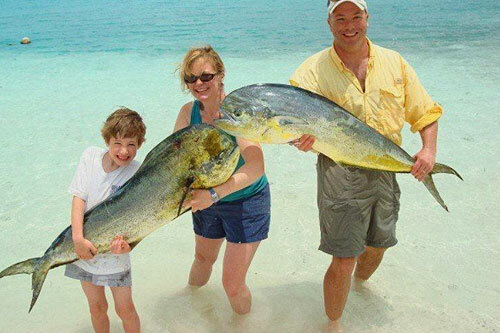 At GS Fishing (Grand Slam Charters), experienced crews and well equipped vessels ensure a day out sport fishing will be a holiday memory to treasure. Other attractions on the islands include the Conch Bar Caves on Middle Caicos, a large chain of underground caverns and caves featuring dramatic geological formations, stalactites and stalagmites. The Conch Farm on the islands is the only one in the world where these shellfish are bred. Conch recipes feature heavily on the menu in T&C and whether it comes in fritter, chowder of curried guise, it has to be tasted before you leave. At the conch hatchery, you will see conch of all ages from babies to adults – they even have two conch that they have managed to train and they bring them out to show visitors. Yes, really! The wildlife of the islands is exotic and will make you feel far from home. Many migratory bird species are glimpsed here including flamingos, giant blue heron, pelicans and more. Turtles, stingrays, dolphin and whales are all regular visitors to the area – the humpback whales who pass on their spring and autumn migrations are a real highlight and attract many awestruck wildlife buffs. The best views are from Grand Turk and Salt Cay. If you seek a holiday destination where nobody has to compromise, the Turks and Caicos islands are the answer! Sun, sea, sand and as much or as little excitement as you want. Just perfect…. Previous story How To Get An Instant Tan Through Self Tanning Products?